when you wander through life utterly certain that there are volumes you’ve yet to learn, a certain thing happens. a wonderful thing. you wake up every morning with your eyes, and your ears, and your heart at full alert. you are the ever-scanner, knowing that at any minute, from any crevice, the light might seep in. might flash in. the wisdom, gosh darn it, will come. by day’s end, by the time you plop that cheek back onto the pillow, by the time you snuggle the sheets up by your chin, tucked back in for one more round of dreams, you’ll have — perhaps — learned a thing or two. gotten just a wee bit wiser. all because the teacher appeared, and you, the eternal student, were ready. so it was the other afternoon as i was listening along in poetry class, when all of a sudden a fellow, a dancer with the new york city ballet, said something that shocked right through me, that slipped in through the crack, just off to the edge of the frame. the subject, allegedly, was poetry. emily dickinson’s poetry, specifically. but in this wonderful class that i can’t stop inhaling, all sorts of wise souls wander onto the scene and peel back the layers of emily, of poetry, in ways i’ve not before known. the discussion at hand was emily’s poem, “i cannot dance opon my toes,” the last poem of the four-week class taught by my beloved professor elisa new. she’d invited damian woetzel, a retired principal dancer with the new york city ballet, and now director of the aspen institute arts programs, to parse emily’s poem. as is professor new’s knack for unlikely pairings in the parsing of poetry, woetzel, a classically-trained ballet dancer, was joined in conversation by charles “l’il buck” riley, a practitioner of a street-dance form known as memphis jookin’ (think breakdance; it’s otherwise known as “gangsta walking”). i felt the ties that bind snap loose. i felt myself freed from the tethers that, long as i can remember, have bound me. do it right, do it correctly, or don’t even try. that was pretty much the lesson i grew up believing. and while it didn’t stop me from trying, it set a nearly impossible bar. “get it right.” or else. but here was a brilliant dancer, here was the director of aspen institute arts, for crying out loud, telling me it needn’t be correct. needn’t be perfect. stumbles are okay. bumps and bruises are beautiful. your whole imperfect self is the most ravishingly beautiful self imaginable. because it’s about something much deeper. it’s about opening up and saying, “this wobbly old soul, this soul that tries and tries, and sometimes makes it and more often stumbles, this is me. it’s a whole new paradigm: the paradigm of imperfection as aim. because what matters lies deep therein. and voice we all have. and, yes, sometimes it warbles. and sometimes it cracks. but it’s a voice and it’s ours. and it’s how we put words to what rustles around deep inside. it’s where our breath resides. it’s the topography that puts height and depth and nooks and crannies — glorious texture — to all that air flowing in and out of our lungs, air keeping us alive. all of this is all the more immediately essential because this sunday i am doing something i’ve never done before. something that might have scared me out of my behoozies. i am walking onto a stage, and i am sitting down beside a cellist and a pianist. it’s a spoken word concert, inspired by one that a beloved friend and editor of mine once saw in japan. i am, for the first time ever, invited into conversations about lighting and stage set, and in the faintest of ways, costume. i’m immersed in the full dimensionality of theatre. and i am discovering what happens when words are lifted from the page. when words are set soaring by the power of cello strings and piano keys, and the alchemies of audible, ephemeral creation. and, as is my natural inclination, i was scared silly. until two things happened: until damian woetzel taught me that it’s not about correct; correct holds little interest, little tension, scant transparency. 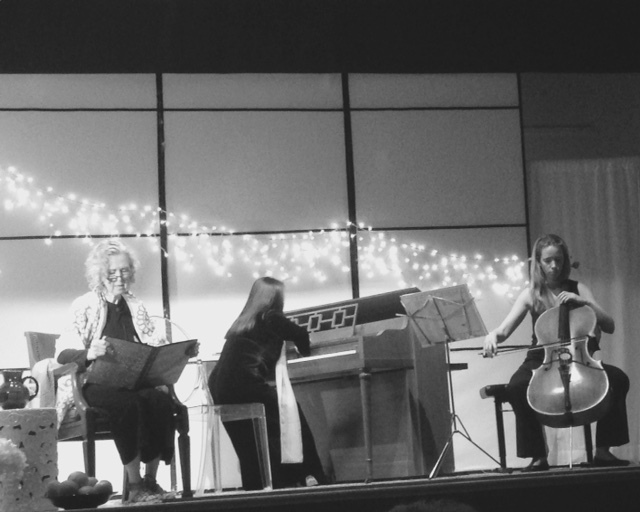 and the other thing that happened is i stepped into the music during rehearsals, and i felt the most astounding flight: cello and piano, cellist and pianist, dove into conversation with the words i was unfurling. and then this, which i’ll preface by saying that many a writer’s whispered prayer is that, in between and through the words, music might come for those reading or listening. and, suddenly, there in the light-filled rehearsal room, i heard it, i felt it. the music did come, did lift and vault and carry the words to places and heights they’d not otherwise have ascended. it comes, the music does, i discovered, when you step onto a stage, and sit down beside a cellist and a pianist who’ve spent their lives deepening their knowledge of the landscape that’s theirs. the power of music, i’ve realized, is the safety net to my trapeze. is what holds me aloft, shooshes away my perpetual fears, is a medium that suddenly felt like coming home, a place where i, at long last, belong. how utterly unlikely. so sunday afternoon at 1, at the midwest buddhist temple in chicago’s old town, i will be walking out from behind a curtain, all in black with a wrap of fuchsia. i’ll be sitting down in a japanese armchair, a bowl of oranges beside me, a vase spilling with springtime white. the cellist will pick up her bow. the pianist will strike a key. and i will put breath, put voice, to my words. and i will remember that the wise ones in the room aren’t there to hear “correct,” they’re there to be moved, to cry, to find a voice, essentially. and that is a truth that sets me soaring. do you, like me, spend far too many hours of life being worried you won’t get it right? and thus binding yourself in ways that demand houdini-like tricks to set you free? that said, here’s an invitation: if you’re near chicago sunday afternoon, find your way to the temple, and plop yourself in a chair. 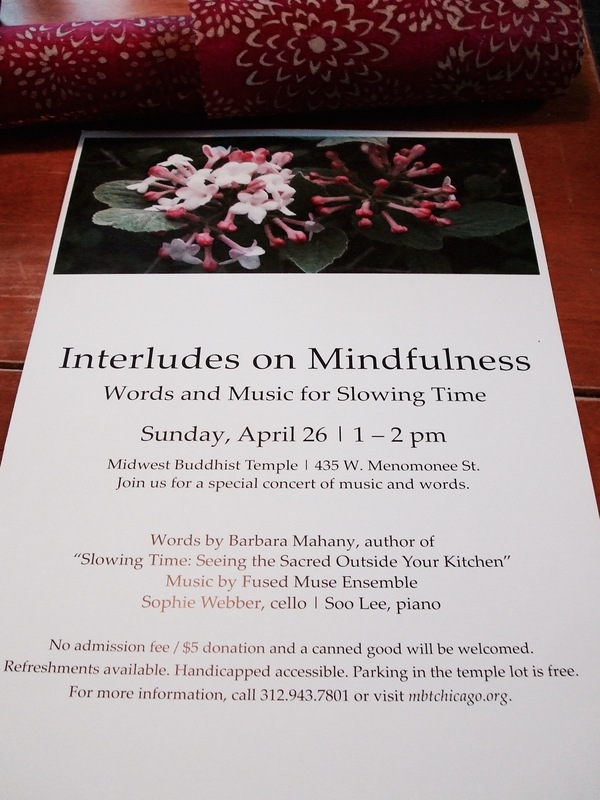 cellist sophie webber and pianist soo young lee, both of fused muse ensemble, will take you places that might take your breath away…..
it’s sunday night, the interludes have ended. it’s quiet now and i’m breathing again. a dear friend snapped this moment of the concert. and i’m enchanted by what appear to be fairy lights wafting across the stage. the cellist is sophie webber, the pianist is soo young lee, both have PhDs in music. both are beautiful. sophie founded fuse muse ensemble, a collective of musicians who dedicate themselves to social causes as well as beautiful music in all forms. 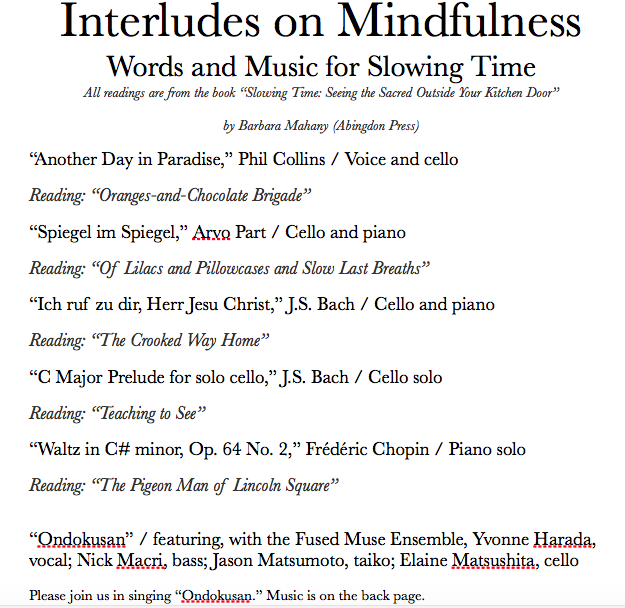 i hope this is only a beginning for us….here’s a peek at the magic of “interludes on mindfulness: words and music for slowing time.” thank you, from the bottom of my heart…. sometimes it’s in the immeasurable glimmer flashing by that we catch notice of the years slipping by. so it was when i got word that eric carle, he who cut and glued the tissue-paper colors of the first childhood i inhaled by heart, he who wrote the rhymes, and pounded out the rhythms of measured bars of caterpillars and brown bears and grouchy ladybugs who ate the page, he would be among the short list of honorees at my firstborn’s college graduation. suddenly, i was back in an overstuffed armchair. a navy plaid. one we’d bought when my belly was full and round, one we’d bought — on what for us amounted to a whim — because suddenly i was overtaken with the urge to have a sitting place, a nesting place, for me and my soon-to-be-born. that boy was not a week old before i cradled him in my arms, plopped him on my lap, perched a book before his eyes, and began to turn the page. one ear pressed against his mama’s heartbeat, and through the other ear, his mama’s voice rising and falling in sing-song brown-bear rhythm. and so it went, through bedtimes and lull times and any time we happened to be curled together on the floor of his room, where a nook carved along the wall cradled all the books of childhood i had gathered for this and any other child. suddenly, in my mind’s eye, in that tumble of remembering, i was perched atop my firstborn’s hand-me-down four-poster bed. he was nestled beside me, my long-legged boy in his little boy pajamas. 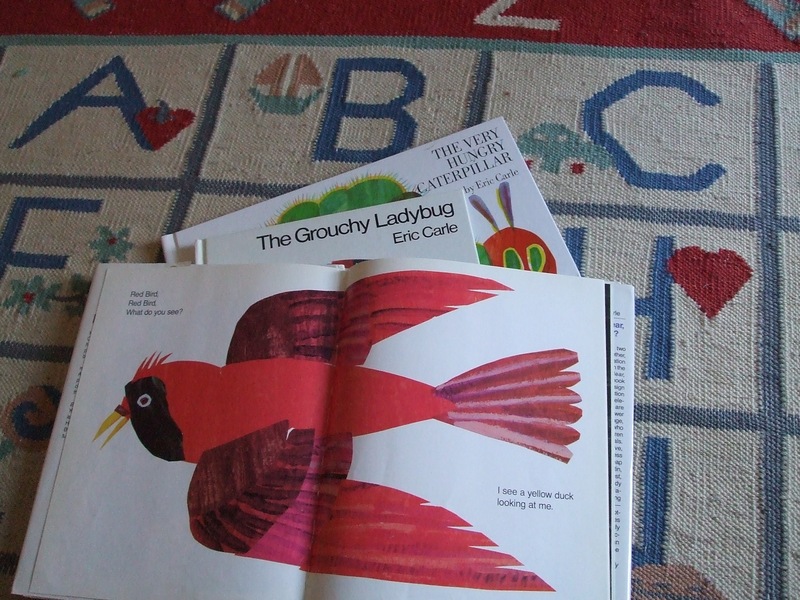 i could see his little hand, dimpled hand, his hand that loved to turn the pages — no pages more so than the ones of eric carle. every child has their natural-born predilection for a certain page. there must be something about the words, the rhyme, the color, or maybe just the humor deep inside. it’s indecipherable, and unpredictable, just what that book, that page, might be. but in the case of our house, our bookshelf, there was no more-loved page-turner than eric carle’s brown bear. “brown bear, brown bear,” i can begin to recite. and i can take it — still — clear through to red bird, and yellow duck, and blue horse, and green frog, and purple cat. i stumble on white dog, but pick right up with black sheep, and goldfish, and then, skipping right by teacher and children, crescendo comes: in which, in rat-a-tat retelling, we tick through the whole menagerie of curiously-colored critters. if i read that book once, i read it three million times. it was in these pages, i’m fairly certain, that my sweet boy learned his yellow from his blue. and for some reason, one that might forever escape me, it’s where i heard him laugh on cue, each time we came to that horse of blue. did he know that horses were not blue? is that what struck him silly? and here we are, the pages barely touched in years. but when i got the news, the news that mr. carle would be presiding, i tumbled up the stairs to the nook in his little brother’s room where the books now stand, forgotten soldiers, stiff-backed, listing, and i pulled out the trinity of carles — hungry caterpillar, grouchy ladybug, and brown bear — and there, i turned the pages, and there i saw the years-old crinkles on a page that once upon a time must have so excited a little page-turner that he up and scrunched that charming goldfish that swims across two pages. that the author of the cornerstones of my firstborn’s childhood would, all these years later, be there, in the flesh, at his college graduation, the ceremonial whirl that is the close of college, well, it just put a zap to my heart, and melted me. and washed me over in a sudden measure of just how many years have passed. how many pages have been turned. and made me ask, again and again, how did we get here? how did we get to this brink of college graduation, a moment that shimmered in the far-off distance, an indecipherable mirage that felt miles beyond my reach? and as is my wont to do, i tick back across time, i hold the celluloid frames up to the light. i study one after another. measured bars all unspooling toward this moment of glory-be, he-made-it. i think of the shadowed hours, the ones when darkness descended, the ones when that blessed child bared his deepest fears and worries. i think of the broken hours, when a dream slipped just beyond his fingers’ reach. i think of the occasional glory, when that beautiful boy felt invincible and whole and understood just why it was he was planted on this holy earth. and so there is symmetry, full circle, weaving together the beginning and the end of this particular chapter, the chapter called school life (even his little brother announced the other afternoon, as if he’d just put two and two together: “gosh, willie is about to be a real adult!”). the beginning and end here seem to have serendipitously been marked by eric carle, a fellow who found his joy, his purpose, in making shapes of brightly-colored tissue paper, and who wrote the score for a childhood measured out in the joy of turning pages, the delight of stumbling on a page that makes you laugh out loud. i wonder if i might wiggle my way through the crush of all those college kids, and yank the wise man’s sleeve, and whisper my almighty thanks for the animation he stitched into our long ago just-beginning picture-book days? who wrote the score of your childhood, or a childhood you’ve been blessed to watch up close? 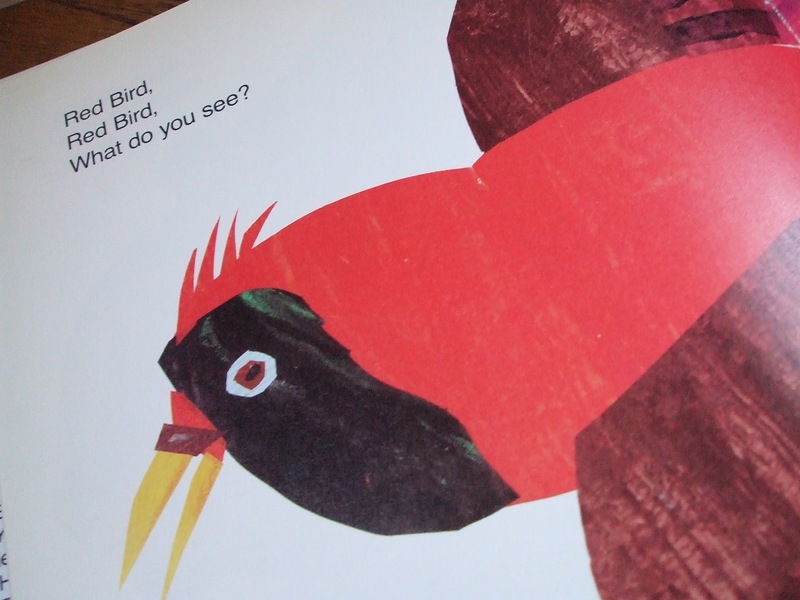 which picture books can you close your eyes and still recite, page by page, word by word? on this particular morning i am particularly tied to my firstborn, who is about to step into the defense of his thesis, his 180-page page-turner. with all my heart and soul i offer up this morning for his prayers and dreams to come tumbling true…. it’s april in the flatlands. and that means twister season. and so it was that yesterday blew across the plains. blew mightily. 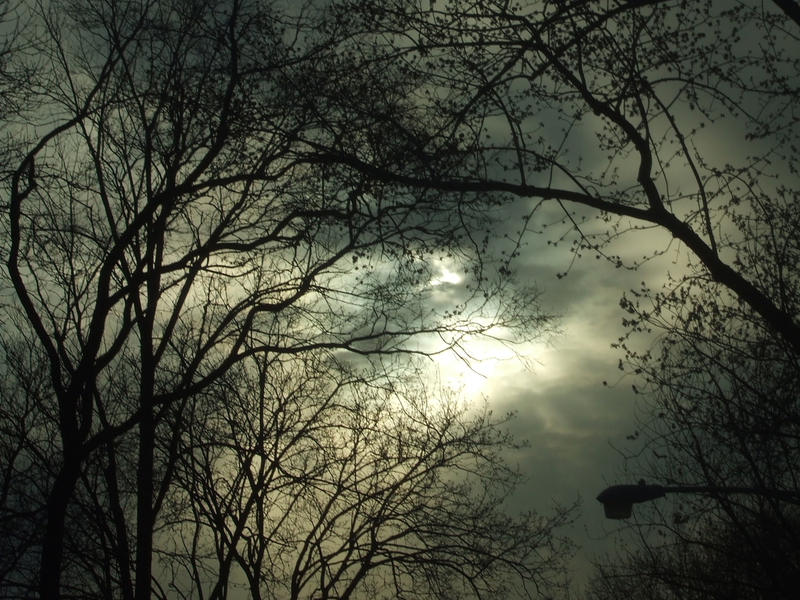 for long hours of the day, the sky was charcoal gray, was roiling. every once in a while, the clouds opened wide, let loose a gusher. early in the morning, when i stepped back into the house, after driving my sweet mate to the train amid thundering downpour, i heard what sounded like a shower running. now, i live with some mighty forgetful folk, but i’ve not lately known them to forget to turn off the shower. so i poked around. more like dashed. followed the sound of splish-splash-splosh till i got to the top of the basement stairs. there i leapt, two stairs at a time, a mighty lope, if i dare say so. the in-home waterfall — the one i’d not ordered — it was gurgily demonstrating its hydro powers. water fell, all right. poured from the ceiling down the wall, and rolled threateningly toward the electrical outlets where i’d yet to pull the plugs. in time, the gushing slowed. became laconic drip. but all day i kept vigil, kept my ear tuned for the susurrations of a leaking basement. by then, the skies darkened, and the weatherman interrupted the broadcast to flash rainbow-colored radar maps onto the TV screen. awful tornadoes tore western and northern illinois to bits. a 50-mile swath, one half-a-mile wide, set new records for hell on earth. gashed the state, and everything in its path, from rockford clear north and east into wisconsin. out my own windows, the winds picked up. the glass panes rattled. and then the howls and whistles started in, the sound of hurling air in swift pursuit of havoc. i must have been asleep by the time the worst of it whirled through. i heard nothing but the cat’s meow at 3 a.m. i let him out but i couldn’t see through the dark of night. couldn’t see the fence blown over. 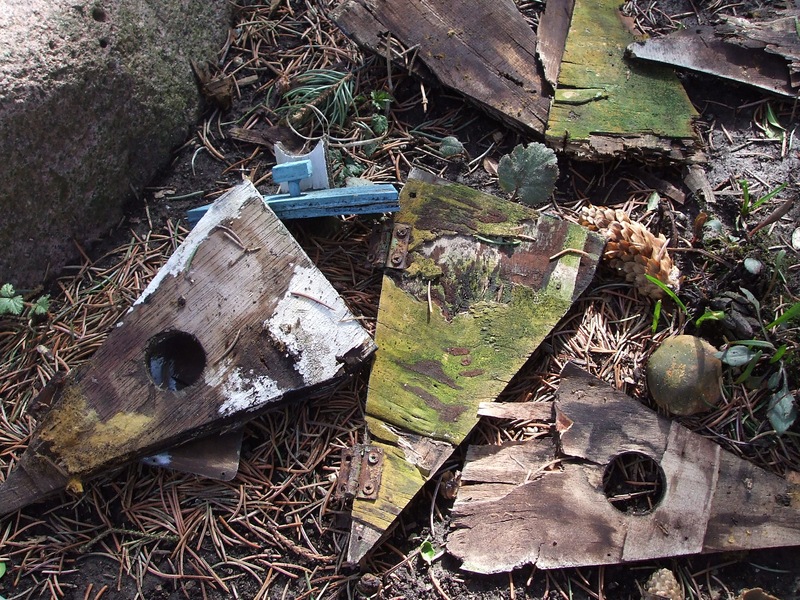 couldn’t see the bird house poles that had been plucked up and torpedoed, steep-roofed projectiles, flying arrows through the night. but once the morning came, once i stepped outside, it was clear, was evident. the yard was not what it had been. something fierce had shattered things. and, come morning, there was only the picking up of pieces to be done. it’s uncanny sometimes, the way the outer world aligns with what’s inside. deep down inside. it’s uncanny how, on this becalmed morning after, i roam the soggy grass, i search for shards of wood, and splintered bird house parts. i pick up the pieces of my storm-splattered yard, and deep inside i try to re-assemble shards of my heart that, too, have been shattered in these recent hours. some days, in the aftermath of storm, it’s the rounds we make, the assessing damage, the gathering of brokenness, that serves to make us whole. whether the brokenness is from the weather’s wrath, or that of someplace deeper. did you stay safe last night? what are your healing rituals the morning after something’s torn you to pieces? the sky is gray. as it should be. as my mama long ago told me it would be. had to be. this was the day that jesus hung on the cross. this was the day they call good friday, though i never have, never will, understand that. it’s a friday i nestle into, to be sure. it’s a friday when i will carve out a hollow of silence. i will wrap myself in silence and gray, gray sky. and if no other story of the christian narrative compels you, this might be one to contemplate deep and hard all life long. i never get to the bottom of it. but every year, come this gray, gray friday, i try. i sink deep into what might have been coursing through a holy man on his way to die. i contemplate how it might be to live a life of trying to right the ways of a world that’s side-stepped what matters, that’s lost sight of how to love, of what it means to make peace with enemies, to embrace the cast-aside, the forgotten, the scorned. and then, at the end of that short life, to be condemned to die. to carry the weight of that cross knowing it’s the instrument of your own death. and all of that i contemplate in silence. it’s one rule from long ago that i try mightily to abide by. my mama made us all be silent. not a word from noon to three, the hours when jesus hung on that cross, the hour when he died. long ago, for all those gray gray fridays, i tiptoed to my bedroom, my one sanctuary in a house of brothers. i sat on my bed, stared out the window at the sky. turned the pages of some evocative telling of those final hours. and waited for the sky to darken, maybe rumble, maybe cleave, at the stroke of three, the hour when jesus died. and so it is here and now, the silence that will infuse the afternoon, when i will retreat to my room, stare out the window, turn the page of some evocative retelling of this gray gray friday. though i don’t, and haven’t, set that rule in my house, have not made my boys abide (though i do offer it as suggestion, nearly every year). i follow all alone the rule of silence. there is such eloquence in silence, particularly amid this noisy, cacophonous world. there is wisdom in allowing thoughts to flow, to follow their course deep down to where the inklings come. or the knowing. it’s as if the rivulets of thawing spring find their way to rushing creek, where the bubbling up begins. it’s rare and it’s a gift, this setting aside an afternoon for silence. for holy thought. for deepening. and this gray gray friday, there is much to contemplate. to breathe deep and fill my soul. the wonder of this particular good friday is that as i pull away from the afternoon’s silence, i will turn to passover’s story of exodus. and there i will be gathered at a table and that story will be told and retold. two compelling narratives in one day at our house. so it is, the blessing of being both. last night, at the mass of the last supper, i listened as one reading told the escape-from-egypt story, and the next told how jesus sat down to the seder, the passover feast, the one that we’ll sit down to tonight and tomorrow night. the intermingling of narratives, the points of intersection, they’re not missed by me. and it’s all part, i think, of what makes the good friday story even more compelling. the contemplation of the depths from which it flowed. this morning i thought i was going to burrow deep on the subject of silence, but, as so often happens, the sentences took me elsewhere. took me this time into jesus and the hours of this deepening afternoon. i don’t often write overtly about the tenets of my religion, or tell its stories here, but indeed they resonate and deeply draw my attention. oh, i wish i’d read those words before i started writing this morning. they grabbed me by the throat, and hold me in their grasp. we are being called to a radical act of empathy. jewish or christian, the stories of this holy blessed weekend are calling us to radical acts of empathy. and therein lies the miracle. that we have the capacity to enter. contemplate the radical act of empathy in how, in our lives, we are called to feel from inside those beyond ourselves. do you, amid your busy days, ever declare interludes of silence, to follow the rivulets of thawing spring to the rushing creek where bubbling comes?